A horse like Thunder is hard to find and he is an attention getter where ever you go. He has a gorgeous champagne body with black legs and a very thick, long black mane and tail, beautiful head, and green eyes. His gait is smooth, he will travel in several speeds and never break gait. He brings these qualities to his offspring. 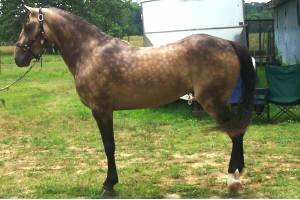 This beautiful stallion will be hard to beat in your breeding program. 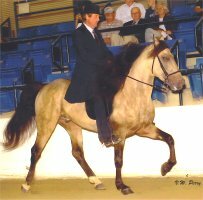 Thunder is currently registered with the following associations; Rocky Mountain, Kentucky Mountain Saddle Horse, Kentucky Natural Gaited, American Gaited, Pleasure Saddle Horse, and the Gaited Baroque Horse Association.